Matthew is Program Coordinator for the Ohio Bird Conservation Initiative (OBCI). 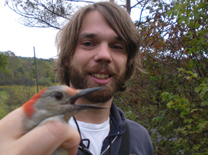 Prior to working with OBCI, he was the Project Coordinator and co-editor for The Second Atlas of Breeding Birds in Ohio. Matthew’s research interests include landscape ecology, and in particular anthropogenic effects on Neotropical migrants. He is also interested in engaging the public into citizen science efforts and exploring new opportunities for collaborative efforts between academia, agency professionals, and amateur ecologists. Matthew redesigned the AFO website in 2014 and acts as the current webmaster.